If you want a car with performance, style, room in the back seat and extra space in the trunk, you'll appreciate the XK Convertible. 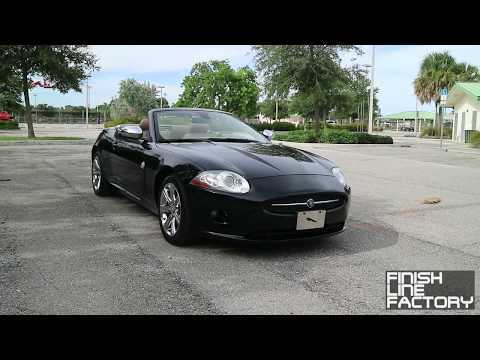 Along with all those luxury features, the XK has huge star power and draws envious stares. Baby blue jag works best car to be seen in. The best car I ever drove. Have had 11 years it is beautiful. People stop me every day to ask about baby blue jag. Fun on the road. Elegant sophisticated gorgeous lines. Comfortable interior and love the interior. No room in back seat just for insurance requirements. ON CERTAIN PASSENGER VEHICLES, THE BRAKE SERVO VACUUM SUPPLY HOSE MAY HAVE BEEN MIS-ROUTED DURING ASSEMBLY. THIS CONDITION MAY BRING THE PIPE TOO CLOSE TO THE EXHAUST GAS RECIRCULATION (EGR) VALVE AND ATTACHMENTS ON THE EXHAUST MANIFOLD. IN THE CASE OF A CONTACT CONDITION, THE BRAKE VACUUM HOSE MAY MELT LEADING TO A LOSS OF BRAKE ASSISTANCE INCREASING THE RISK OF A CRASH. DEALERS WILL INSPECT THE BRAKE VACUUM HOSE ROUTING AND ADJUST AS NECESSARY. THE HOSE WILL BE REPLACED IF THERE ARE SIGNS OF DAMAGE. THE RECALL IS EXPECTED TO BEGIN ON OR ABOUT JUNE 1, 2007. OWNERS MAY CONTACT JAGUAR AT 1-800-452-4827.